Getting regular screenings is the only way to truly know whether or not you have an infection. Annual checks are recommended to all sexually active individuals. Consider getting screened today at one of our STD Testing West Virginia locations. When you undergo screenings on a routine basis, you are protecting more than just yourself. You are also protecting your sexual partners and preventing the spread of disease. Get checked today at a STD Testing WV location. Sexually transmitted diseases can cause a variety of complications, including Pelvic Inflammatory Disease, infertility, or neurological damage. There is no reason to risk your health and well-being. Visit one of our STD Testing WV laboratories for your test today. We offer nearly 20 STD Testing WV lab locations centers in West Virginia. 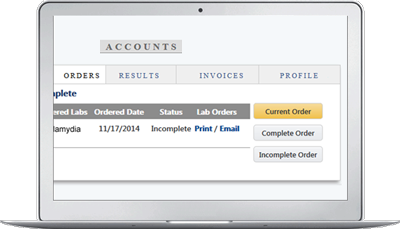 Simply locate the lab closest to you and bring your lab order in. No appointment is necessary and your visit will only take about 15 minutes for STD Testing West Virginia. We'll get you your results in as little as three business days. If your STD Testing West Virginia results come back positive, a member of our clinical staff will consult with you. With nearly 20 STD Testing West Virginia lab locations, it is easy to find a lab that is near you. There are no swabs or physical exams involved. Your information is secure with us throughout your screening process. We abide by all state and federal privacy regulations and will never release your information without your consent. We provide screenings through FDA approved and/or CLIA certified STD Testing West Virginia lab centers. They use the same diagnostic methods used by doctors and hospitals around the country. With our STD testing WV locations, you will get results you can count on and excellent patient care. Choose us for your screening needs and get checked for STD Testing WV today.